This might be a unique situation, but I wanted to document it somewhere in case anyone else runs into the same issues. Here’s the scenario: I have an O365 tenant set up with hybrid voice (SFB 2015 Enterprise on prem), with users homed online. User line URIs are set on prem, replicated to the cloud, and PSTN calls in/out go via the onprem server. This is a textbook hybrid deployment, and everything was working just fine. A few months ago, calling plans came to Canada, and we got involved in the preview, so I assigned licenses to a couple of accounts to test it out. The online phone numbers worked just fine, and I promptly forgot all about them until the licenses expired, at which point a user with an online phone number that tried to make a call got connected to an announcement service saying that “you are not configured for this calling feature”. Obviously, at this point I wanted to revert those users back to the onprem connectivity. Step 1-try removing the phone number from the user in the portal…doesn’t work. It just informs you that “phone numbers could not be unassigned from 1 of 1 users”. OK, then I thought maybe I had to remove the calling plan license from the user first. Tried that, but then still couldn’t unassign the phone number. I also tried going in and removing the phone number from the phone numbers interface, which gave me the same error. At this point I decided that powershell might be the way to force the issue, and was able to run Remove-CsOnlineTelephoneNumber to delete the number from the account. Move the user back on prem, and then online: This actually worked, in that while the user was homed onprem, they could make and receive calls, but when I moved them back online, the original problem returned. The next day, I checked the account, and lo and behold, the user’s line URI had reverted. I had to re-enable EV for the user, but once I did (and waited for the provisioning to take effect), everything was back to normal. It’s probably a good idea not to let calling plan licenses expire. If you do have to move a user from calling plan back to onprem PSTN, it might take a while. Once you do move them, you might have to re-enable EV across the board. This might get messy at scale, with users unable to make/receive calls for a period of time. If anyone has figured out a way to get this to take effect more immediately, I’d love to know about it, but in the meantime, if you have the same issue, I suppose the only solution is to just wait it out. I ran into an issue today where I was trying to send a call from Skype for Business (which I’ll continue to refer to as Lync here because it’s shorter) to an application via the PSTN. The telephony setup is a little strange in my lab because there are several different environments with their own distinct servers working from the same gateway, so I’m trying to call from Lync A, out through an Audiocodes Mediant 1000, then back in through the same gateway into Lync B on a configured line URI. I actually had this working from an outside line, but if I tried calling through the gateway, I’d get a 485 back on the mediation server with an error saying “Multiple users associated with the source phone number” Off to google it, and I found a blog post from three years ago describing the same issue. That I wrote… I knew this problem sounded familiar. This time, however, I managed to figure out a solution. I think the issue goes something like this: The users on my domain had line URIs that looked like tel:+19058825000;ext=2154 (main autoattendant number plus extension). The caller ID coming from the gateway was <sip:19058825000;phone-context=PstnGateway_192.168.213.21@rnd.computer-talk.com;user=phone>;epid=0146001F41;tag=79915bb9. The front end saw this and tried to match to an account, which it appears to do without any regard for the extension parameter (since, in the Microsoft world, apparently everyone has a DID). It matched multiple users, hence the ambiguous error. Which routes just fine. I’d still probably class this as a bug, but at least now I know there’s a workaround for it. So, in three more years when I have this problem again, now I’ll find the answer when I search for the error. 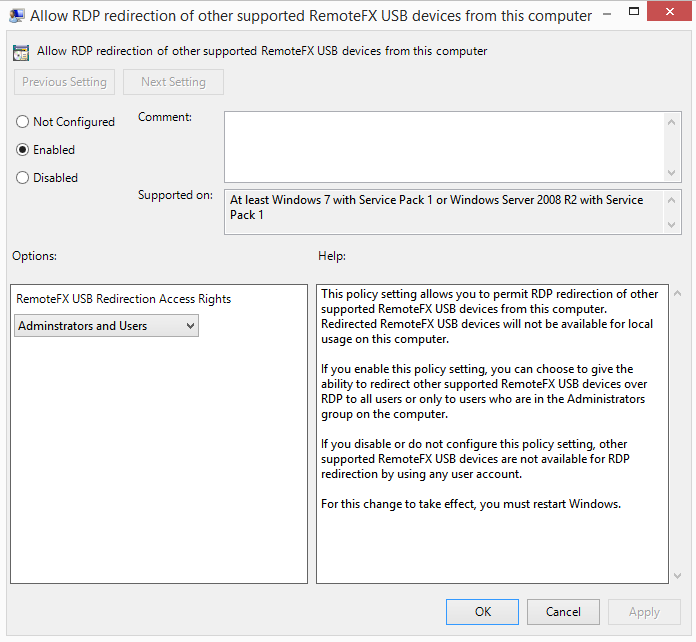 There’s a good overview on what RemoteFX USB redirection does and how to configure it here on MSDN, although I did have to make some changes to the steps there to do what I needed to get it to work. Terminal Server: Running Server 2012 R2, Remote Desktop Services, and Office 2013 (connected to both the private and external networks). 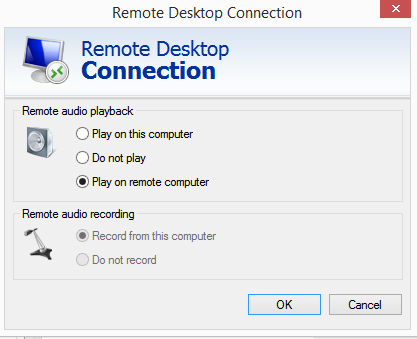 You may also want to change “Allow audio and video playback redirection” and “allow audio recording redirection” under “Remote Desktop Session\Device and Resource Redirection\”. 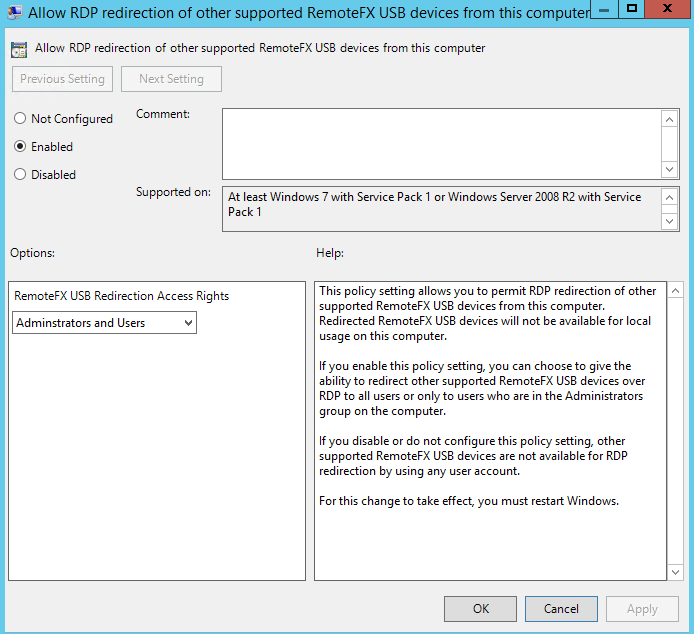 This is what allows you to share the default devices on an RDP session (sometimes useful). Next, click the remote audio settings and disable remote audio playback and recording. These settings will override USB redirection and will mean that “remote audio” is the only device that appears in the VM. Then connect to the session, and you should see a driver installation dialog that says something like “installing Plantronics Savi 7xx-M (redirected)” that should disappear fairly quickly. 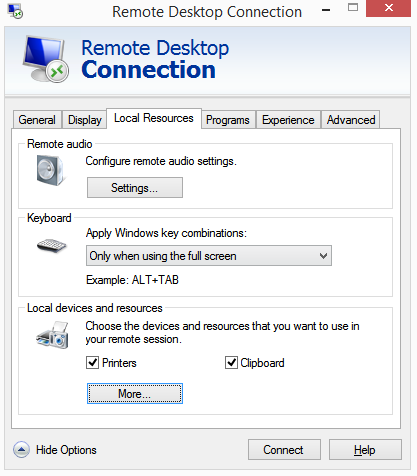 After that, you should have your AV device appearing natively in the remote desktop session. 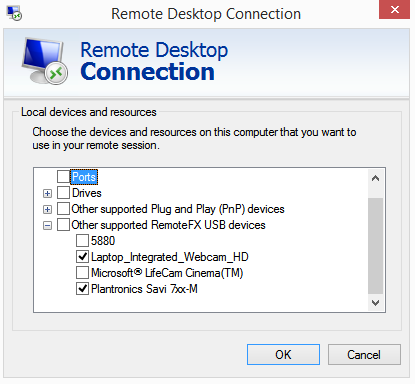 Of course, this works for multiple sessions and devices as well, so if you connect two headsets or speakerphones and two cameras, and log into the TS via RDP with two different users, you can place a video call between them and have each user get their own audio and video device. The number of unique AV devices is really only limited by the number of USB ports you have available. Now, as for why this is useful, it’s great if you want to validate AV conferencing scenarios, or, say, UCMA applications that use custom audio routes, and want to do all of this in an isolated VM environment where it’s also not really practical to attach multiple devices to the virtual switch, which is where I use this kind of setup. However you use it though, this is kind of a neat setup to show people, and it helped me understand how some new virtualization and remote desktop features work. I already wrote about UCMA 3 applications and Lync 2013, and working on that post got me thinking about what configurations (supported or not) will actually work. As a disclaimer for all of this, these results are based on some reasonably quick testing of a UCMA app. I haven’t tested the entire runtime, so there may be problems that I don’t know about (although if you find cases that don’t work, drop me a line and let me know what you find). That being said, the app I tested with set up an AudioVideoCall, created conferences, set custom audio routes, added and removed participants from a conference through dial out, used TTS, and processed Instant Messaging calls, so I’m reasonably confident that most of these cases are going to work out just fine. I also don’t have any references to UC workflow in my projects (and neither should you, because it’s gone in UCMA 4), so there’s not that complication to worry about. Most of this started with a reasonably simple question-how can you build a UCMA 3 application and a UCMA 4 application on the same machine. As I’m sure others have found, attempting to install the UCMA 4 sdk on a machine that has UCMA 3 installed will force you to uninstall the old version before proceeding, but really, what is this error saying? UCMA is really just a series of assembly references, and a runtime, right? And I can have multiple .net versions installed on the same box, so why not UCMA? As it turns out, it’s possible, but you have to selectively uninstall things, and be willing to work with manual provisioning in development (which I’d recommend doing anyway). This is the stuff that installs in C:\Program Files\Microsoft Lync Server 2010\Deployment, and contains the files you need to bootstrap the machine, and install the local config store. These are installed on every machine in the topology, and will have to get uninstalled if you want to dual build/target. Note that if you’ve auto provisioned any applications on your server, they won’t work after this, so switch those over to manual provisioning (set –RequiresReplication to $false on your pool) on the 2010 server. The SDK is a bunch of files that installs under C:\Program Files\Microsoft UCMA 3.0\SDK, and really, the files you care about are in C:\Program Files\Microsoft UCMA 3.0\SDK\Core\Bin. There is no reason that these can’t coexist, but I’ll detail an optional step in a minute to keep things even cleaner for you. Now, the UCMA 4 SDK installs new versions of each of these components. The SDK files are actually the nicest, since they install to C:\Program Files\Microsoft UCMA 4.0\SDK, and can exist quite nicely beside the UCMA 3 versions. The core components can’t exist concurrently though, and that’s what causes the setup error on the SDK install. Version 11 of Microsoft.speech also can’t coexist with version 10.2, but in this case, the UCMA 4 install won’t fail if you have it on there already, so while you’ll get the new SDK files, your speech runtime will remain at 10.2. Interestingly enough, this doesn’t seem to matter. The other thing to mention before getting to the results is .net. UCMA 3 was built against .net 3.5, and the supported scenarios all have UCMA apps targeting this version of the framework. UCMA 4 on the other hand, targets .net 4.5. Of course, it’s well documented that an uplevel .net application can use an assembly from an earlier framework, so is there any reason that your UCMA 3 app can’t use .net 4.5 too? As it turns out, no, there probably isn’t. Referencing the UCMA 3 libraries in a .net 4.5 project worked, but you need to make sure to set the <startup useLegacyV2RuntimeActivationPolicy=”true”> in your app.config file (standard practice for loading an old assembly in new .net). Note that I didn’t make any code changes in the app, but it did use the newer framework. Building a UCMA 4 application using the old (10.2) speech runtime worked just fine. Running a UCMA 3 application using the new (11.0) speech runtime worked just fine too, and actually seemed to have better TTS than the old version. If you’re manually provisioning, it doesn’t seem to matter whether OCSCore is installed or not. 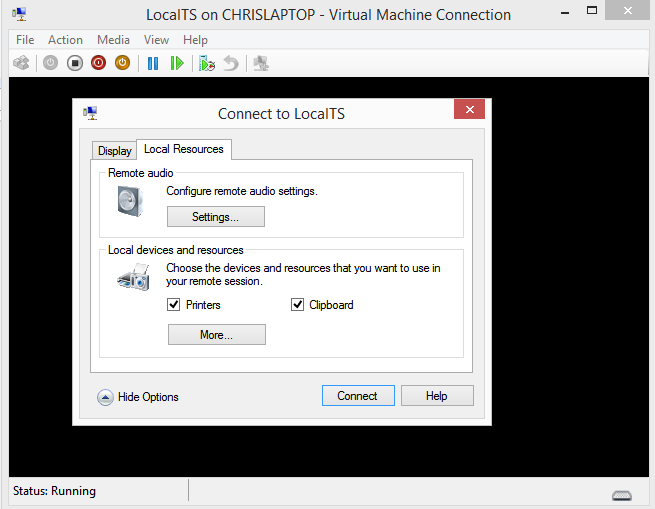 UCMA 4 apps run against Lync 2010. I didn’t expect that to work, but it does imply that there are little to no changes in the SIP layer. This is one case I’m definitely going to investigate further though, since the one thing I did not try is running this in a pure 2010 environment (not a hybrid), mostly because all of my dev lync environments are hybrids now. Interesting prospects though. I didn’t bother testing UCMA 4 with a lower level .net, but I don’t think it’d work. Verify that the v11 speech SDK is installed, and install any additional voices you want. Update your project to .net 4.5 if you want (although you could also split out by .net version). So far, this seems to have worked out well, and going into the next full QA round for our products we’ll be testing these configurations more thoroughly. I’m pretty impressed that these cases all worked out, but it would have been nice if it’d been easier to set this up. I can understand why two versions of OCSCore can’t exist on the same machine, but why not the speech runtime and voices? In any case, this is what I managed to figure out through testing these cases out myself, and the end results are that this all looks really promising. Have any of you tried these configurations yourself, and if so, what does and doesn’t work? Any other things to watch out for? No matter what type of UCMA application you want to write, one of the first things you’ll need to do is set up your environment to work with the Lync server. No matter what, this involves configuring a machine certificate, installing the prerequisites, and provisioning your application using the Lync Management shell. The official documentation on provisioning has come a long way for UCMA 4, so I’ll just point you to here (General Provisioning steps) for the basic steps. This post is just going to cover the changes for each method, and why you’d choose one over the other. And then finding the appropriate cert based on the FQDN. It’ll also mean storing a lot more application configuration than you would in the auto provisioned case, but we’ll see in a minute why that might not be a bad trade off. The application server does not need to be a member of the same domain as the Lync server, or even a member of ANY domain. Even a workgroup computer will work, which I’ve used when building reusable VMs containing UCMA apps. This can be really handy for cases where you’re deploying a managed application in an environment where someone wants you to support your app, but doesn’t want you having full domain access. Setup of the local replica can take a while: Usually, this goes pretty smoothly, but there’s more stuff to install, more reboots of the server, and more cmdlets to run to get replication working correctly. In general, it seems like more trouble than it’s worth just to avoid having to copy a gruu around. You can easily run applications against multiple Lync domains: Switching between a dev, test, and production Lync server is just a matter of changing a setting in your app. No re-provisioning required. So, when to use each? Ideally, support both in your app-it’s not difficult to add a flag, and you’ll need to store configuration information anyway, so give your users the option. When you’re in development, you’re definitely going to want to use manual provisioning. I know that I switch between Lync environments all the time, and my main Lync lab domain is separate from the domain my dev machines sit on. It’s much more flexible, and other than the initial setup of copying the settings from Lync to the app server, management has never been a problem. When deploying in production though, I’ll often flip things over to automatic provisioning if possible, just to keep the application servers in the topology, and allow Lync admins to manage app server certificates through the management shell. As always though, having the option gives you flexibility in whether you’re on the domain or not. Now that Lync 2013 is RTM, UCMA developers are left with a difficult choice. Do you upgrade your existing apps to UCMA 4.0, or stick with 3.0? The simplest answer to this question is-do you plan on supporting Lync 2010 or not? If so, then sticking with 3.0 seems to be the safest bet, since your code will work in both places. If you absolutely have to have async (given that .net 4.5 support is pretty much the only new feature in UCMA 4), then by all means upgrade. It’s a painless process, since existing code should just work, but be forewarned that you’ll only be able to run against Lync 3013 pools. This means either keeping two build configurations and sets of binaries, or not targeting anyone who hasn’t upgraded yet. First, consider a case of a pure Lync 2013 environment (i.e. not an upgrade from 2010). On the application server, open the Lync management shell and run New-CsTrustedApplicationPool –Identity <ApplicationPoolFQDN> -Registrar <lync 2013 FQDN> -Site <Lync 2013 site ID> . This is the same command you’d run for 2010. Run New-CsTrustedApplication and New-CsTrustedApplicationEndpoint, just as you would with 2010. Don’t forget to run enable-csTopology to publish your changes. Otherwise, they’ll get wiped out the next time someone else makes a change. Install the rest of the prerequisites on the app server by running C:\Program Files\Microsoft Lync Server 2010\Deployment\Bootstrapper.exe /BootstrapLocalMgmt /MinCache . This installs the local SQL express instance for auto provisioning. What’s interesting here is that if you look on the Lync server, you’ll actually see the application server under the 2010 branch in the topology builder, and not the 2013 one. At this point, you’re good to get your certificates configured, and add more apps and endpoints to the server if you want. I’ve found that anything you do using the 2010 PS on the app server works just fine, and keeps things in the 2010 hub. On the application server, open the Lync management shell and run New-CsTrustedApplicationPool –Identity <ApplicationPoolFQDN> -Registrar <lync 2013 FQDN> -Site <Lync 2013 site ID> –RequiresReplication $False . Note that you’re disabling replication here. Now, just to try it out, I ran these cmdlets from the 2013 powershell window instead of the application server, which meant that the app server appeared in the list of Lync 2013 application servers. When I tried my apps though, everything seemed to work, so it appears that the issues that others were having in the beta about not being able to manage legacy objects from the 2013 PS have been resolved. I don’t know if there are any long term implications for having the server appear under the 2013 branch though, so if anyone knows of any, please let me know. Write-Host "Please remove the pool from from the lync 2013 topology builder and publish the topology before proceeding"
Read-Host "Hit enter to continue:"
Which is saying that you can’t delete a legacy pool from the 2013 tools. The problem is, you also can’t delete it from the 2010 powershell. You can, however, delete it from the 2013 topology builder, but if you do this you lose the provisioning information that this script tries to hard to save. What you need to do is run the script with –isLegacy $true. This will gather all the info, pause the script, and then tell you to delete the existing pool. When it pauses, open the topology builder, locate your pool, delete it, and then publish. Then, let the script continue and everything should get recreated. I tried having the script detect this case, but that big red failure of Remove-CSTrustedApplicationPool didn’t actually throw an exception, so I wasn’t able to catch it. Feel free to modify and improve on this script if you’d like-I’m a .net developer, not a powershell ninja, and this is actually the first reusable script I’ve come up with. Although, seeing how useful it can be, it probably won’t be the last. So, to summarize, UCMA 3.0 applications appear to “just work” against Lync 2013 as promised, which is great to see, and other than the upgrade path being a little more cumbersome than it needs to be, things will continue to work as they have in the past. Has anyone out there found something about a UCMA 3 app that won’t work with Lync 2013? If so, shoot me an email or leave a comment-I haven’t seen anything myself, but I’d love to know if there’s something else to watch out for. The RTM version of Lync 2013 has been available for a while now, but one of the things that you might notice when you come to it from 2010 is that the logging tool (OCSLogger.exe) is not installed on the system. I know if was there in Beta, so I didn’t think they’d axed it, and luckily I did manage to find this download link for the tracing tools. Not only does this contain the OCSLogger.exe, but also the snooper download from the resource kit. As for what to expect, the tools work pretty much the same as before, with snooper actually performing much faster than it did in the past. This tool is absolutely essential for troubleshooting Lync issues, since there’s often more information in a trace than in the UCMA exceptions. This is also true for app servers-you can run OCSLogger on a UCMA server and get traces to that machine from SIPStack and S4 (which actually stands for Simple Scalable SIP Stack) to troubleshoot there as well. Anyway, just a quick post in case anyone else runs into the same issue. No, OCSLogger hasn’t disappeared yet-it’s just better hidden. 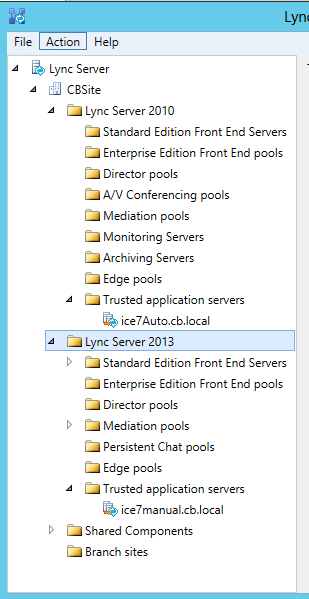 Something else to add to the TODO list when installing a new Lync server or app server I suppose.